On Thursday, I decided to go for a walk in Coldfall Wood, to see what was going on. It was a hot, humid day, the path already crunchy underfoot with fallen leaves. And then, from a copse of Hornbeam trees, I head the most unearthly racket. A whole family of Ring-necked Parakeets were calling to one another in the leaves overhead. 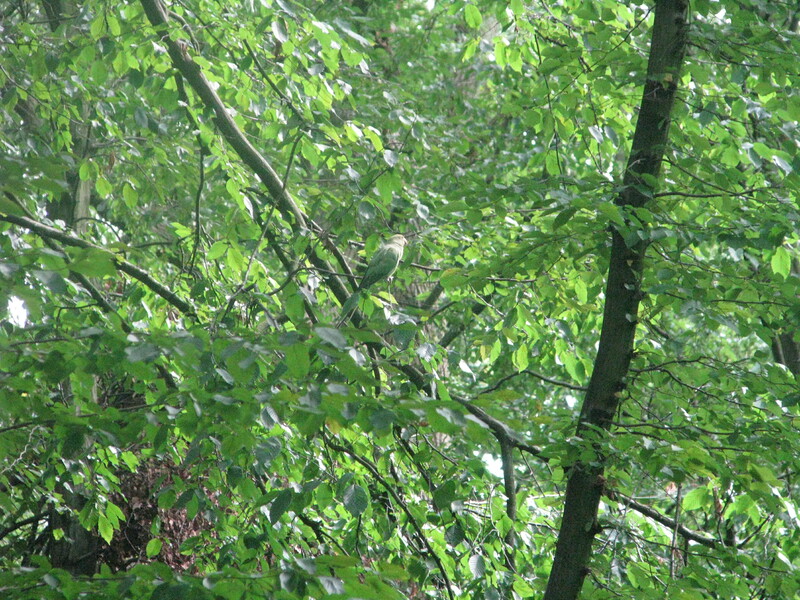 I counted five young parakeets, plus their parents, plus some other adults who were getting in in the act. 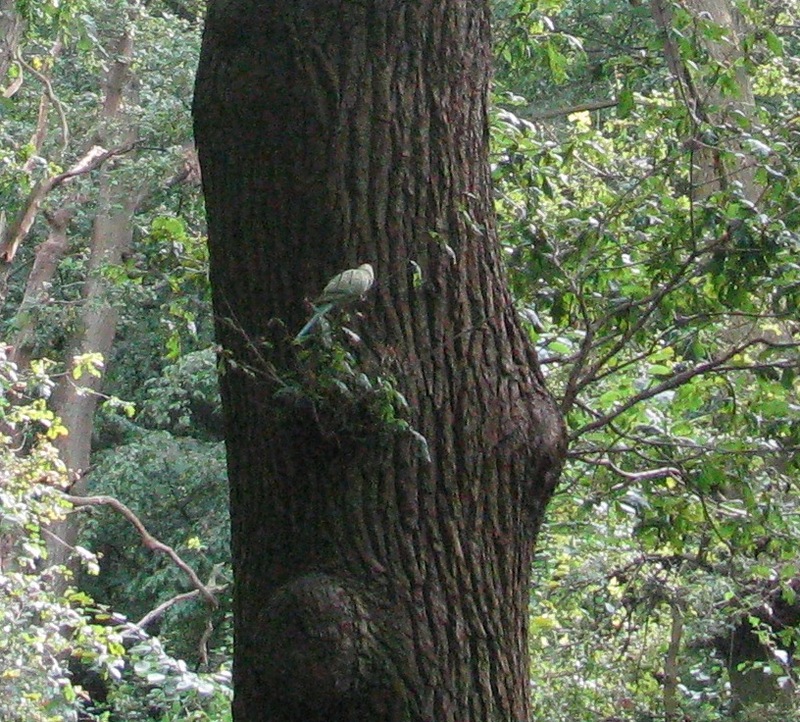 What on earth are parakeets doing in a North London woodland? There are many legends about their origin, one being that all the birds in London descend from a pair owned by guitar legend Jimi Hendrix, and released during an acid trip. Regardless of their origin, the birds first bred in the London area in the late 1960’s/early 1970’s, probably following an accidental release from a pet shop in Sunbury. They were shortly joined by birds who escaped from an aviary in Syon Park, when debris from a plane broke a glass pane. It is clear that these birds take advantage of every opportunity to escape, and their intelligence and adaptability continued to serve them well: they will come to birdfeeders (and in my garden, they have occasionally dismantled them), and will take all manner of foods. In his wonderful book ‘The Birds of London’, Andrew Self outlines the way that the birds spread. By 2003 there were small populations all over London, but the chief roost was close to Esher Rugby Club, where there were nearly 7000 birds. However, in 2006 someone decided to fell the trees that the birds roosted in, and the colony broke up. Whether this accounts for the spread of the birds to most parts of London remains to be seen. Certainly, when my husband and I were doing the Capital Ring around London, there was no area of greenery, from Richmond Park to Hampstead Heath to Hainault, where you couldn’t hear that familar squawk. 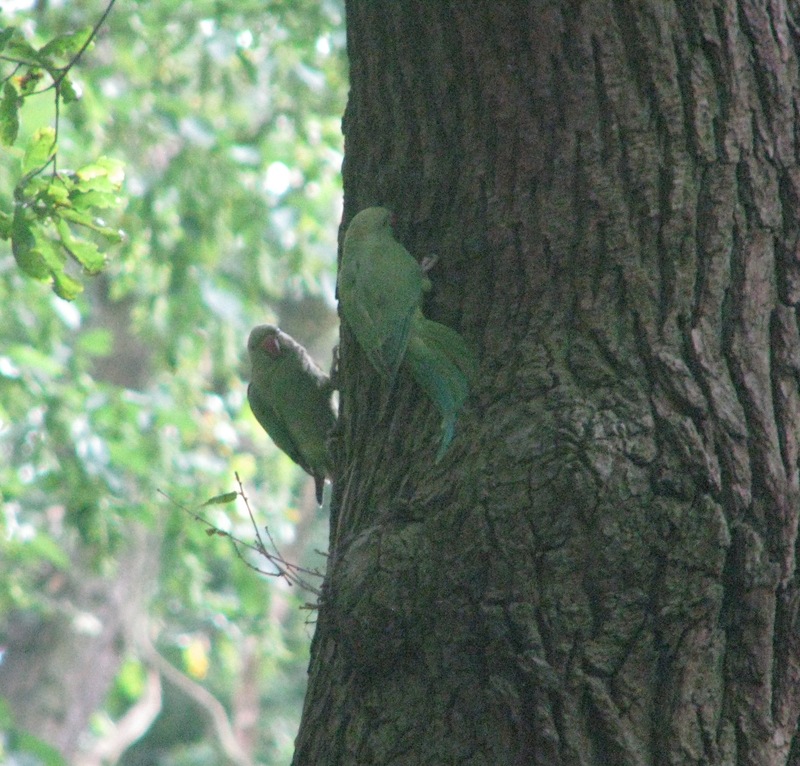 A male and female Ringnecked Parakeet checking out a nest site © Copyright Ian Capper and licensed for reuse under this Creative Commons Licence. Ringnecked Parakeets like to nest in hollow trees, and there is some debate about how far they compete with native birds like woodpeckers for nesting sites. In Coldfall Wood I have seen both Greater Spotted and Green Woodpeckers, so hopefully there are enough places for all of them to raise their chicks. In any case, it’s part of good sylvaculture to leave dead trees, preferably standing, to provide for crevice-nesting birds, and more and more local councils and management bodies are taking this into account. For such a vividly coloured bird, the Ringnecked Parakeet can be surprisingly well camouflaged. People associate parrots with warm climates, and indeed, the London population is the most northerly sizeable parrot population in the world (about 30,000 birds in 2010). 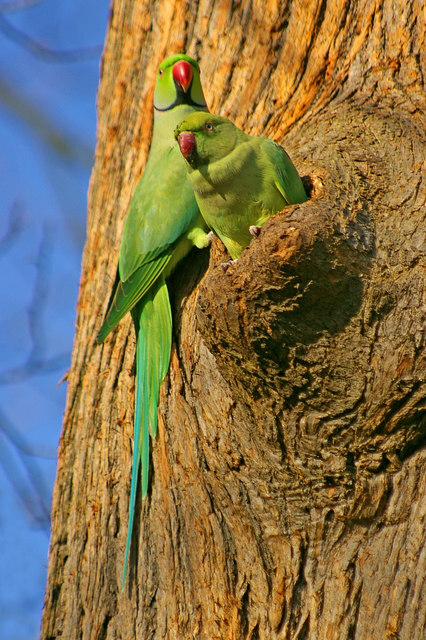 However, the Ringnecked Parakeets come originally from India, and I can vouch for the freezing cold nights that they are able to survive. They are sociable birds, who huddle together for warmth, and the fact that cities are a few degrees hotter than the surrounding countryside may make all the difference to their survival. until her long-suffering mum dragged her away. If you want children to be interested in their environment, what better place to start than with a bright-green bird who doesn’t fly away from cameras or children or even large groups of people all craning their heads to watch them? With their chattiness and sociability, their chippiness and their delight in showing off, Ringnecked Parakeets feel to me like quintessential Londoners. And, after almost fifty years, they are as much a part of our wildlife as the woodpigeon or the blackbird. We’d better get used to them, I think. Ringnecked Parakeets are here to stay. Ringnecked Parakeet eating sweet chestnuts in Kew Gardens © Copyright Christine Matthews and licensed for reuse under this Creative Commons Licence. 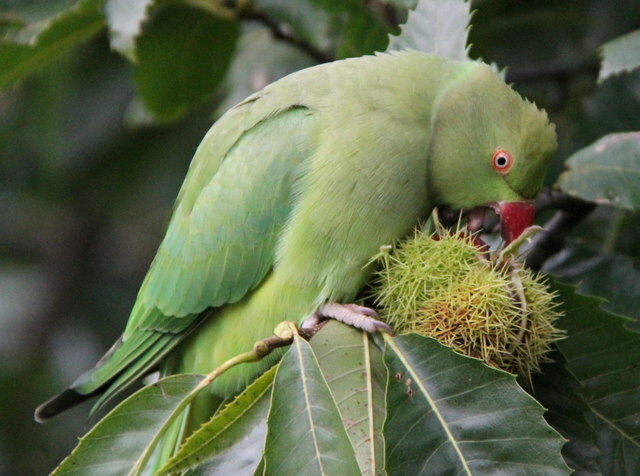 This entry was posted in London Birds, London Places on August 2, 2014 by Bug Woman. Lovely post! They’ve been around Walthamstow for about 18 months now and always brighten my day..
I’ve seen them spreadeagled against a tree trunk (oak, in Coldfall Wood) sunbathing.